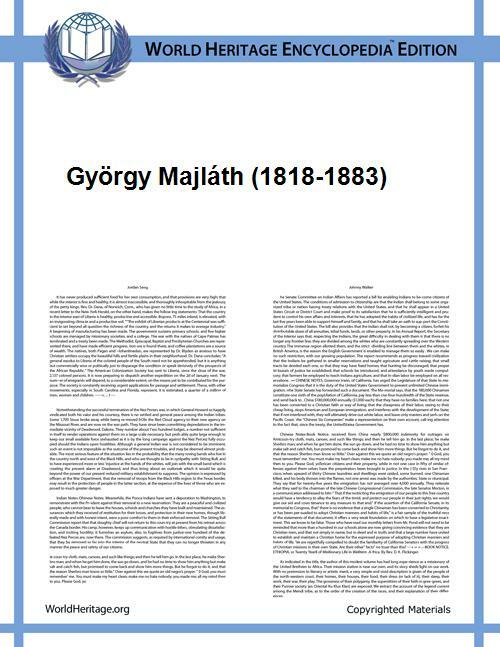 The native form of this personal name is Majláth György. This article uses the Western name order. György Majláth (December 7, 1818 – March 29, 1883), also known by his German name Georg von Majláth, was a Hungarian politician. Majláth was born in Bratislava, then in the Kingdom of Hungary (in modern-day Slovakia), to György Majláth, also a Hungarian politician. He entered the civil service of the county of Baranya, of which he was deputy from 1839 to 1843. The legislature appointed him administrator of the county in 1843, and county head in 1848. However he withdrew to private life during the Hungarian Revolution of 1848. He reentered politics a decade later, playing a large part from 1859 in a strengthened legislature. In 1866 he became Chancellor of Hungary, and later the judex curiae (judge royal) of Hungary. He was Speaker of the Diet of Hungary from March 22, 1867 to March 29, 1883, his death. He was killed during a robbery in 1883.